To keep the butterflies fluid and moving and separated from the curvy, swirly background filler, I added a small scale cross hatch border around them. As you can see in the next 2 photos, the quilt is more like a whole cloth quilt then a pieced quilt, with a great deal more FMQ then applique or piecing. 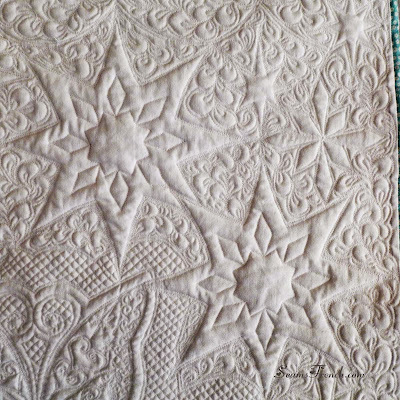 Variations of the quilted stars mimic the shapes of the appliqued stars and form the basis of the quilting design. 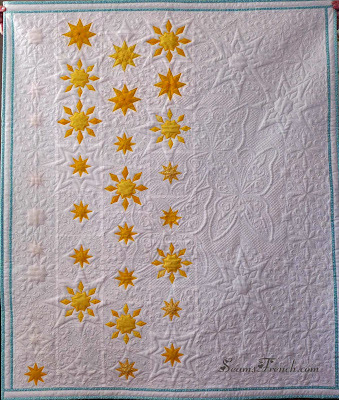 On the back of the quilt, a row of falling stars drop into a pocket, which doubles as the quilt label. 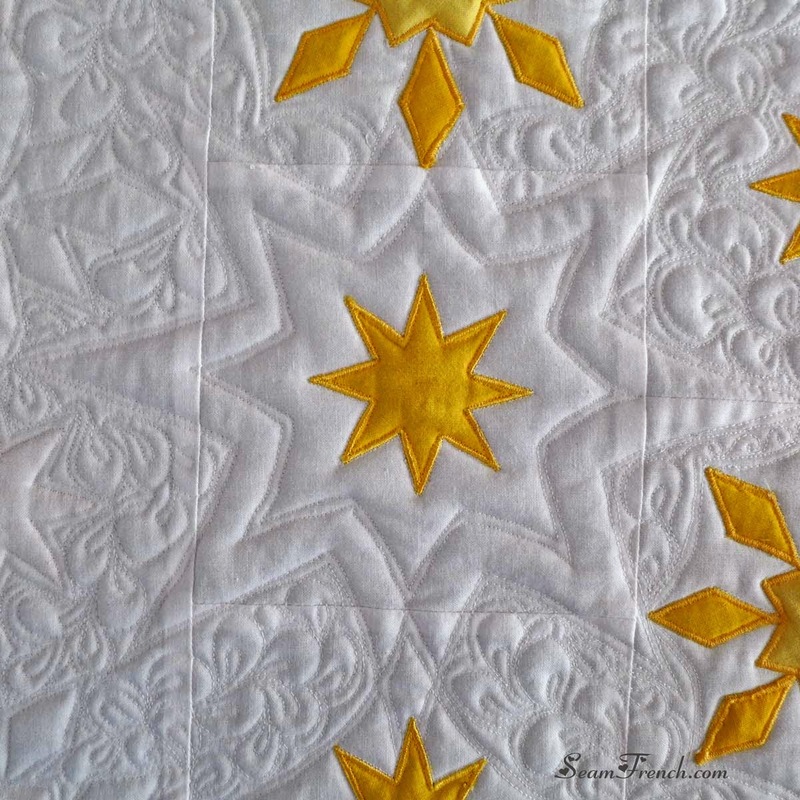 Close-up of the back of the quilt. 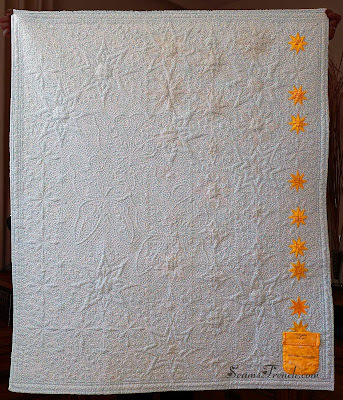 The front of the completed quilt. 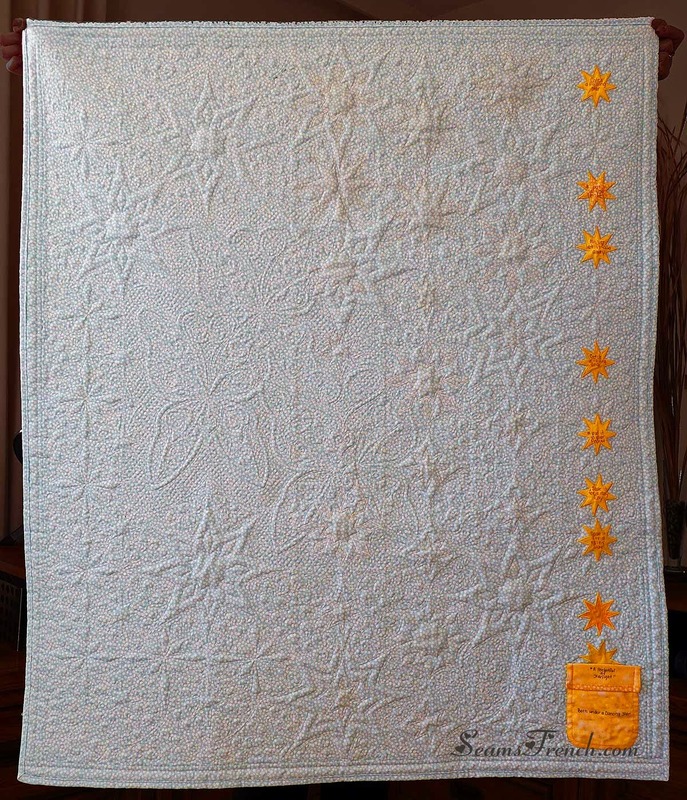 So now that our little grand baby is happily dreaming under the stars, it's on to the next project (or 10!) for this gram. That is unbelievable beautiful! WOW. What a keepsake! My goodness, this is wonderful! 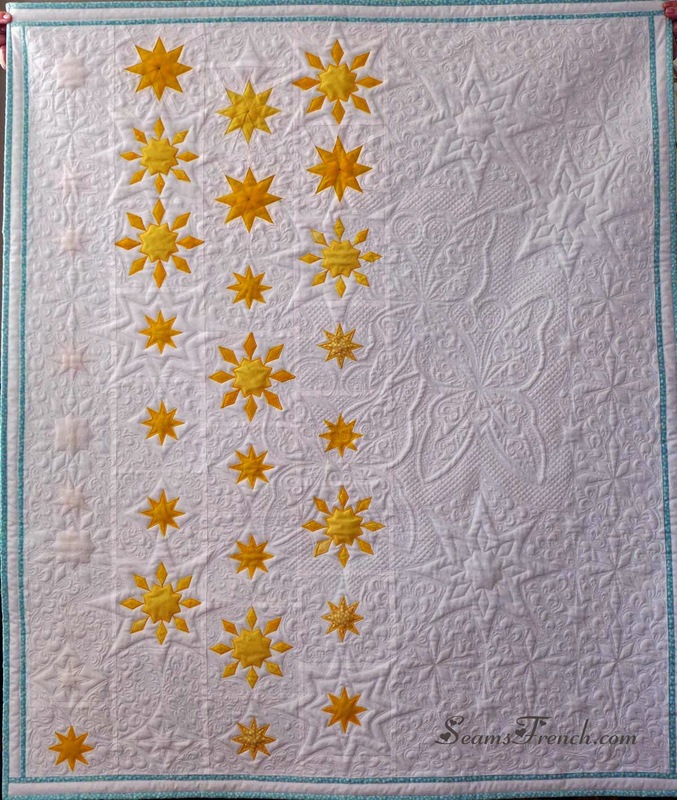 It is so clever with the stars showing through on the front and back, and the quilting designs seem better than ever. That cross hatching looks perfect -- did you use a ruler or is it just freehand? What a lucky baby -- congratulations! Ah yes, it would have been clever of me to plan on having the stars shining through the layers if it had been intentional. Lucky break this time! 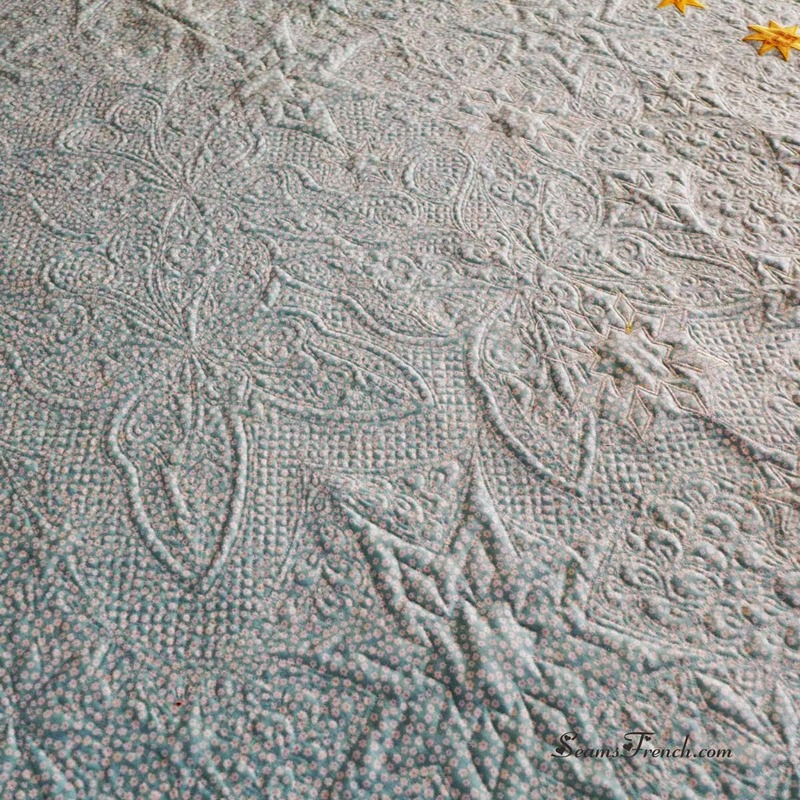 The border around the butterflies went through many different permutations before I finally settled on the cross hatch. The stitching on the cross hatch is free motion, however, I did mark in some reference lines with a ruler to make sure the rows remained parallel. Thanks so much for your comments; I always appreciate your input. Oh my stars!!!!! 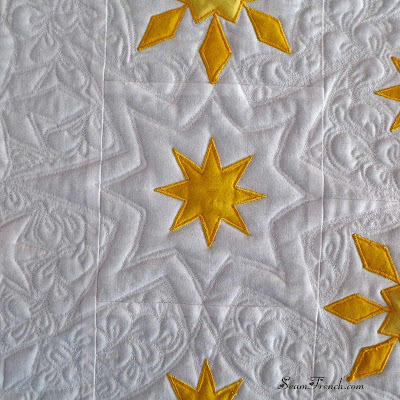 This is, quite possibly, the most beautiful free motion quilting I've ever seen. What a blessed baby!!! Thanks so much for your very kind comments and your support. And thank you for your help in in sourcing organic baby cottons at the beginning of this endeavour. Much appreciated. 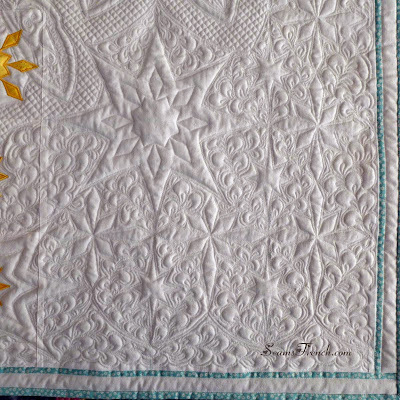 gorgeous quilt, it is destined to be a much loved heirloom, I'm sure! 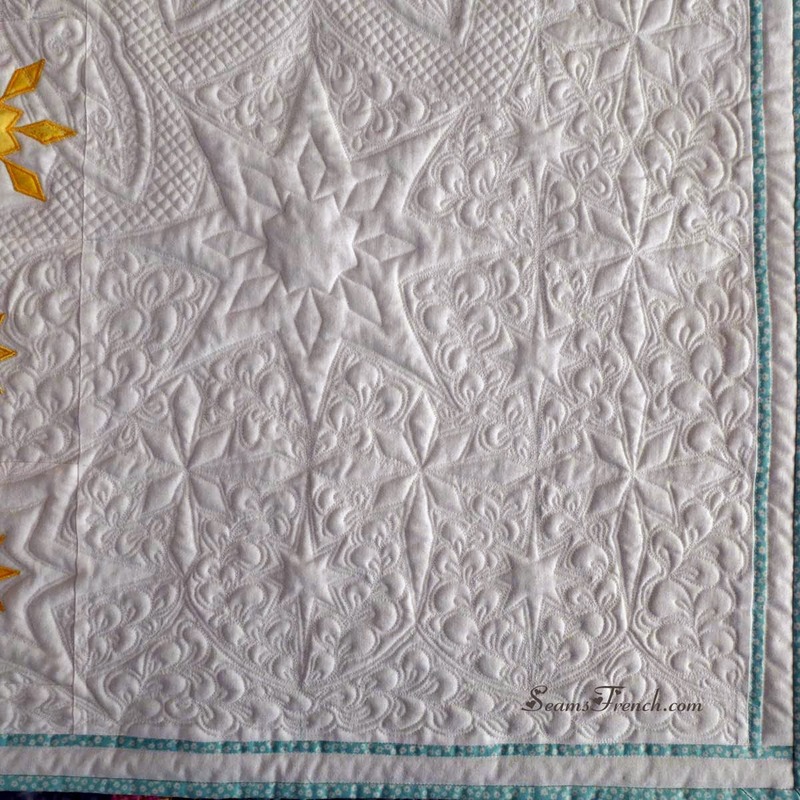 I am in awe of your machine quilting! Just beautiful! 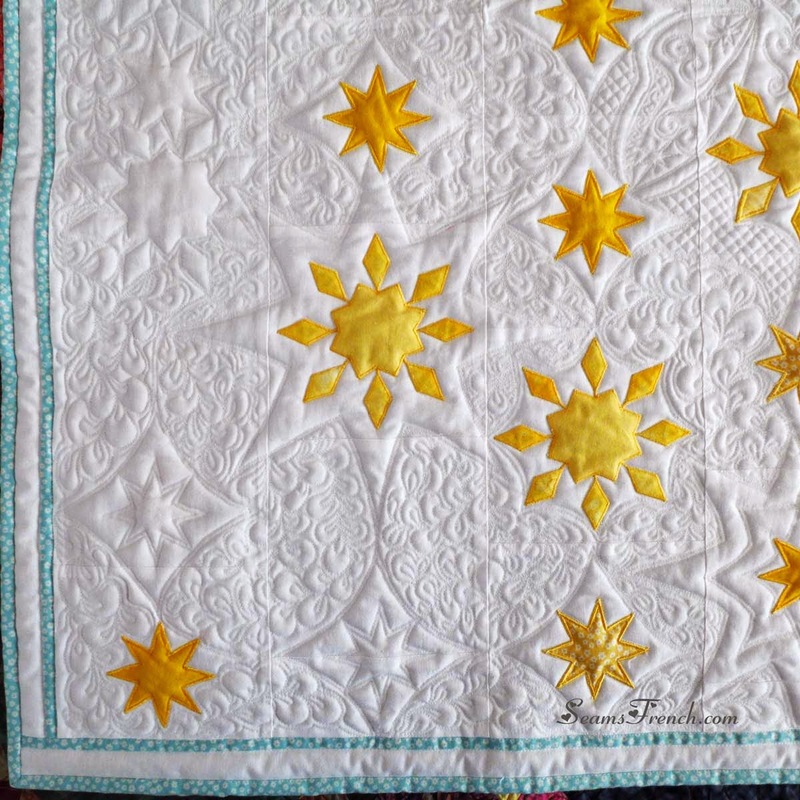 The quilt is amazing! 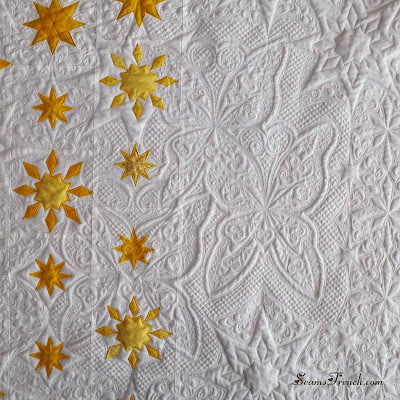 It is hard to believe that you do this on a regular sewing machine and not a long arm machine. I wish I had that talent! It is exquisite. Such a lucky little girl to have such a loving and talented grandma! I adore the simplicity of the yellow and white and all the lovely quilting! You are much too kind and generous Karen. You inspire me with both your exquisite work and your dedication to family and friends. Thank you so much. This is sooooo beautiful! 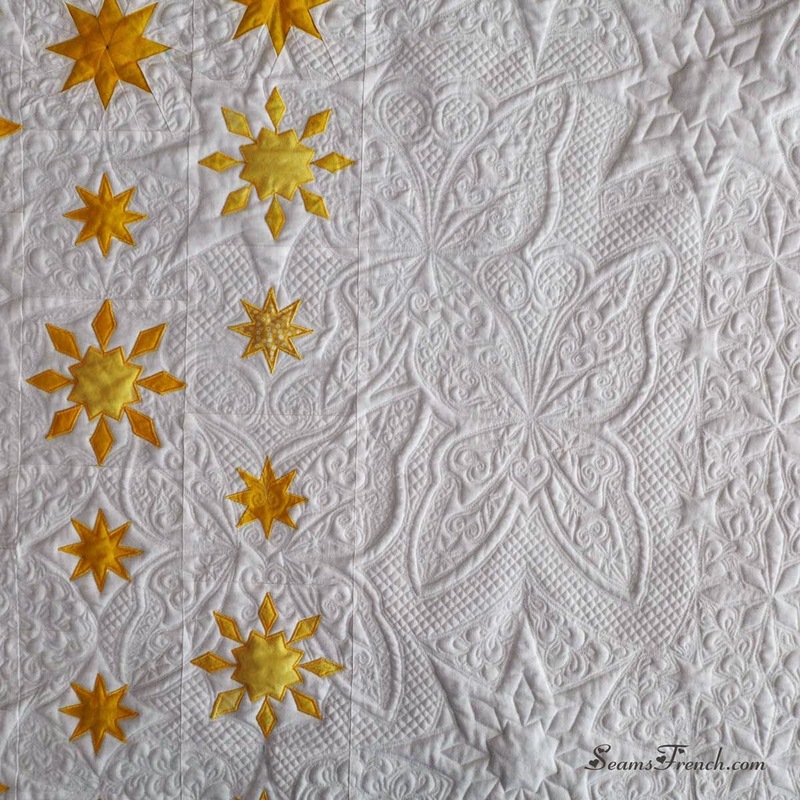 Your quilting is exquisite! 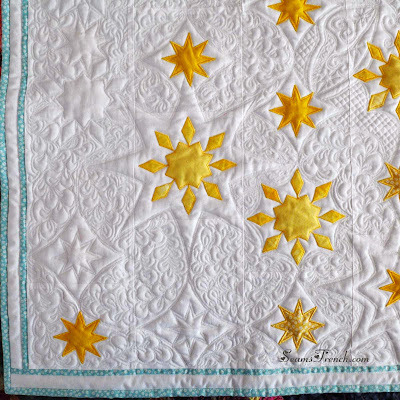 Lucky baby, I hope mama takes good care of the quilt and doesn't let baby drag it through the mud. What's the next project? Now I have that song running through my head, which is not a bad thing. Thanks Cynthia. 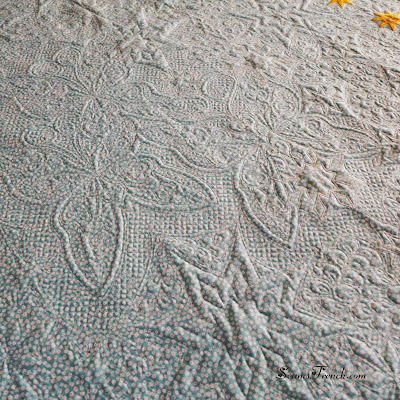 I think that mama is so worried about soiling the quilt, baby may never be allowed to sleep under it, although that would be a little sad and would sort of defeat the purpose:) As to the next project, there's another baby quilt in the works for extended family, and there's always a boutis project (or 3) on the list. Glad to see you back in the blogisphere. 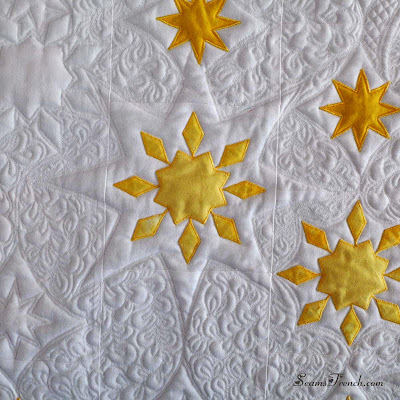 That is truly a stunning and glorious quilt design!